Back in late June, we learned/heard that BG had a commit from WR Darrell Wyatt of Martin Luther King in Detroit. Now, we see that he is headed to CMU. The original info came from 24/7, which still doesn't list him as a de-commit. Best of luck to Darrell. Excellent column from David Briggs, who is simply an outstanding writer. His topic today is the BG Football program, which he addresses with the most damning language of all: facts. You should read it. The basic idea is that BG is tied for the lead in off-season arrests. (Something Briggs chose not to make note of is that BG is tied with Texas Tech, for whatever that might be worth). The other idea is that this is making the hot seat for Jinks even hotter. So read the column. I have a couple thoughts to add. First, I think BG fans expect the program to have dignity. I expect us to do things the right way. We've frankly had more of our share of these issues over the years, but they are as bad now as they have ever been now. And, as the article notes, similar things are not happening at Toledo, Michigan, Ohio State, etc. The teams we are chasing are winning without these problems. Here's the problem for Jinks. It gives the University a new reason--and a potentially more defensible one--for making a change. It's one thing to buy a coach out for losing. Some people might think that's not right. But for running a program struggling with these issues and hurting the school's overall reputation? That might be a little easier to sell. I have been thinking about this quite a bit. Jinks certainly deserves a chance to prove he can succeed. He claims we are close. We shall see, he has said that all the time, even in season 1. BG did not hold a 4th quarter lead in any of the games they lost last year. And, yes, there were a couple close losses but BG won by a miracle in the Miami game, which was essentially lost. Anyway, what has me concerned is the recruiting, which is not moving at the pace it had in the first two years and when it was the only thing that Jinks could point to as a success. I am sure other schools are telling recruits to question how long Jinks will be at BG, and if they aren't then I am sure the recruits are smart enough to figure it out for themselves. It appears to be taking a toll. It hasn't wiped it out, but it has moved us from the elite parts of the MAC to the next level down, and we're trying to catch up to them so you don't like to see that gap widening. (Also, let us wonder what compromises BG might have made to get those recruits, based on the discipline issues). Here's what I have been thinking: Jinks either needs to do well enough this year to earn an extension or he needs to go. To earn an extension, I'd think you'd need significant improvement on the field and in the demeanor of the program. With another bad season and the end of the contract looming even closer, these issues become magnified. BG saw with Louis Orr what a couple lame ducks years look like--the program is still set back. The buyout was an issue when it was for the whole contract, but it is less now that it would only be two years. And the arrests just make this an easier decision to make. Briggs notes that Jinks is a nice guy and it does seem to be that he is. So was Tom Amstutz. Jinks has yet to show anything that indicates he's ready to be an FBS Head Coach. The best thing for the program would be for that to happen, though it's just as hard to see as it always has been. But, if the University chooses to ride it out, lame duck style, a long wilderness looms ahead. And next time--whenever that is--no more Texas coaches please. Coach Jinks took a few minutes to talk to Todd Walker at Media Day in Detroit. Normally, these things don't yield much except Coachspeak, but there were a couple items that I thought were most of interest. First, he says that Doege is now playing at over 200 pounds, which is a good sign for a young man who was light last year and a little fragile. His health is paramount...we don't show a ton of depth at WR. Andrew Clair is similarly matured and Coach thinks he could take 22-25 carries per game. Second, he said the o-line will be one of the strengths of the team. If true, that's a huge step forward for the team. He said you wouldn't recognize some of the players due to their size gains since last year. Anyway, o-line on paper is a concern, but if these guys are jelling, then they have the potential to be good for a while. Coach thinks he could go 10 deep. Third, he called Carl Pellini "one of the great defensive minds in the country" and he has said that before. Went through the whole lineage. If he can grind any kind of productivity out of the unit--like, keeping MAC scoring under 30 points, even as BG plays OU, Toledo, etc--BG has a shot to be competitive. So, the MAC Media made its predictions as part of media day, which is an annual tradition. They have picked BG #5 in the East, and not especially close to #4, which is Akron. The good thing is that the Media is often wrong. Having said that, there's no rational basis to pick BG any higher than this. The Falcons might well exceed expectations and do better than this--in fact, a lot is riding on just that happening--but if you're making predictions on what's most likely to happen, #5 is the place to go and that's mostly because Kent would be expected to be completely awful. You might have had us checked in for a slight increase at the end of last year, what with these young players moving into position, but given the off-season issues it's hard to predict anything higher than this. For it to happen, Doege has to really click (and stay healthy) and Pellini has to make a significant improvement to the defense with about what Eliano had to work with, if not less. 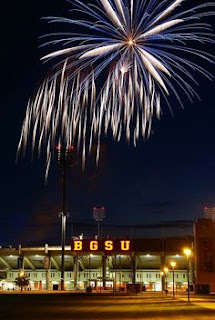 BG scored 31 and allowed 39 in MAC play last year. At a minimum, those two numbers need to be reversed for BG to have a chance to be anything other than 5th. More previews will be coming as the season nears. In the meantime, though, the consensus on the program is clear and will stay that way until BG performs its way out of it. Other notes. First, Ohio has very high expectations this year, particularly on the offensive side of the ball. Phil Steele thinks they will have one of the most productive offenses in the country. They have clearly established themselves as the strongest program in the East, with Buffalo and Miami trying to get into that mix. I was surprised Miami wasn't higher. I was a little surprised at NIU being picked to win the West by 15 out of 22 voters. Toledo seems to me to be loaded, but the Huskies are consistently good. They host UT but look to me to have the tougher cross-over schedule. The bad news continues to get worse for the BG football program, as two more expected contributors on the defensive side of the ball have been dismissed from the program, per The Blade. The players are Armani Posey (LB) and Dirion Hutchins (DL). Both played significantly last year and would have been expected to play a lot this year. Posey was #6 on the team in tackles and Hutchins played in 12 games. This has been known for a little while. Posey has already been adjudicated. It might explain some of the late JUCO pick ups. For those scoring at home, both players came to BG during the Babers-Jinks transition. Posey committed to Jinks right before signing day. Hutchins committed to Babers, de-committed when Babers left and then re-committed to Jinks, again right before signing day. Since spring practice or so, BG has lost Datrin Guyton, Mike Wilcox. Cooper Lee, Cam Jefferies, Calvin Clater, Tyree Jackson, Jamari Rouse and now Posey and Hutchins. That's five additional players on the defensive side of the ball for a unit that was #11 in the MAC last year. I applaud the University's actions on this. At other places, far more serious issues have been swept under the rug. I don't want us to be a school like that. It is already not great to have these things happen and would be worse if they were tolerated. From a competitive standpoint, this makes a tough job even tougher. BG was 2-10 last year and Coach has been pointing to the first recruiting classes as the ones that were going to bring us back, and those just keep getting thinner. Recruits seem to be a little shier this year than in other years and that just promises to get worse if the team doesn't rebound this year. Just a lot of question marks. So, BG has added another transfer WR, I assume to be eligible in '19 but I'm never sure whether there is some secret codicil of the transfer rules being triggered. The young man is Isaiah Johnson-Mack and he's from Palm Beach. He was a highly decorated player in HS, ranked as a 3-star recruit by Rivals, along with being all-state, region, etc, as both a junior and a senior. He then went to Washington State, where he played for two seasons. He made 95 catches in that time, for an odd 8.4 yards per reception. He scored 6 touchdowns. Then, he decided to transfer. He got into a public fight with Mike Leach over his release. At the time, he said he wanted to transfer to be closer to his "2-year-old son and soon to be 1 year-old-daughter.” So, Leach did grant a release, but only to FBS schools in Florida and then also FCS schools. That occurred last December. Then, he was apparently unable to land with any FBS school in Florida--something that seems very surprising to me--and went to Duquesne, which is definitely closer to Florida than Washington is, but still probably not what was intended at the beginning. (His HS QB is also at Duquesne, FWIW). Anyway, he never played at Duquesne at all, and announced his transfer to BG yesterday. He was going to be eligible at Duquesne immediately, but I don't know if that applies to BG. He's 6'3" and 216 pounds, which is good size for a MAC WR. He was clearly productive in the PAC-12, though it seems odd to me that none of the mid-major Florida schools were available to him. He left the program voluntarily, unlike our previous star WR transfers. Also, he played for Mike Leach, proving again that all roads lead to Lubbock. Welcome to the Falcons, Isaiah. We've added a couple of home games to our future schedules. We've completed the 2021 non-conference schedule by hosting Murray State on 9/18/21. Also, we will host Fordham on 8/29/24. Just a quick note on this scheduling announcement from BGSU, which is based not so much on the fact that we have scheduled Murray State and Fordham, but to notice a trend in those schedules. Basically, for the next three years, BG plays 2 P5 teams, one G5 team and one FCS team....something I think is the right balance for us. I would prefer to only play 1 P5 team, but I do understand the financials. BG has another commit and this one is a player rated with 3-stars who had other D1 options. His name is Michael Love, and he's a Chicago-area RB who 24/7 projects as a WR in the MAC. I know that ratings are suspect, but you do like to see your program picking up guys who had been offered by other FBS programs. In this case, the young man was offered by NIU, WKU and Western Illinois. His brother plays at Notre Dame and in this article Michael is described as sneaky fast. He played on a good HS team, which lost in the final in DeKalb for the Illinois title in 6A, the third-largest classification in that state. Love finished the big game with 6 catches for 121 yards and a score. Overall, for his junior season he had 12 touchdowns. Overall, this is the 3rd straight player BG has signed who had FBS options and was ranked. It should help calm the nerves about the recruiting mojo at BG for the time being. Welcome to the Falcons, Michael. Update: Here's an excellent local article on Michael. His brother was a second-team All-American, and they seem very high on him at Nazareth.